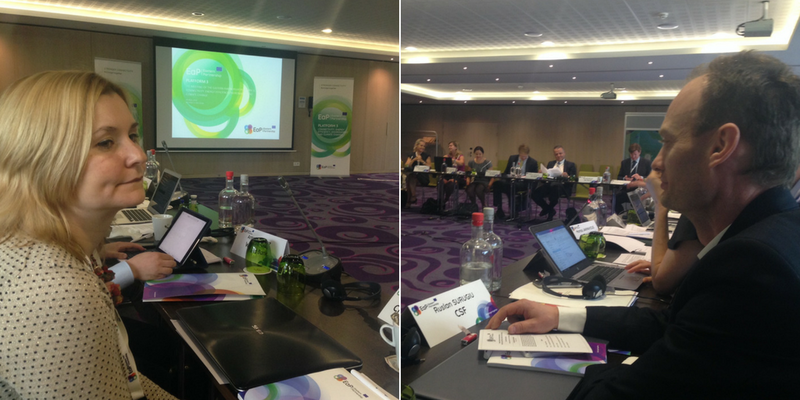 On 29 May 2018, the Eastern Partnership Platform 3 “Connectivity, energy efficiency, environment and climate change” gathered in Brussels to discuss implementation of policies on transport and energy, focusing on investment priorities and sustainable connectivity. The Eastern Partnership Civil Society Forum (EaP CSF) was represented by Ina Coseru, member of the EaP CSF Steering Committee and coordinator of the Working Group 3 on Environment, climate change and energy security, and Ruslan Surugiu, President of AO Pro Energy (Moldova). During the first part of the meeting, the Platform 3 Work Programme for 2018-2019 was adopted, following a debate on the strategic priorities for 2018-2019 for each of the panels under Platform 3: transport; energy; environment and climate change. The EaP CSF representatives contributed to the discussion and shared the Forum’s feedback and recommendations, which are included in our written input ‘2020 Deliverables Put to Work: EaP CSF commentary on Work Plans of the Eastern Partnership Platforms and Panels‘. This document was released in March and distributed among the relevant EaP and EU stakeholders. On the strategic priorities for energy, our representatives asked for full transposition of the Energy III Package, aiming at creating/developing a competitive energy market in EaP countries. They also pledged for strengthening a cross-sector systemic and dynamic approach to the economic, environmental, social and political challenges; and for the inclusion of multi-stakeholder consultations in the elaboration of the strategies and action plans (IFIs, experts, CSOs, private sector). The need for more transparency in the decision making processes of state institutions was also raised. Ms Coseru and Mr Surugiu could also present the views of the EaP CSF during the two parts of the debate on investment priorities and planning: towards sustainability of finance. Our representatives shared experiences on setting up structures and processes to promote sustainability, such as the Energy Efficiency Fund from Moldova, not a very efficient institution. They also commented on positive examples from funds in Slovenia and Poland and how this expertise should be disseminated for creation of new structures in EaP countries. On improving transparency, the EaP CSF suggested further involvement of IFIs representatives in the management of financing structures, which could result in more transparent selection processes. How could policy reforms in support of the energy transition be accelerated? How to best set up administrative structures and processes to promote low-carbon investments (including energy efficiency)? Which elements would help putting in place healthy, transparent and robust structures to make investments sustainable over time and avoid stranded assets? What are the main obstacles you see for the preparation and implementation of the priority projects as outlined in the draft Eastern Partnership Transport Investment Action Plan? How do you envisage EU involvement in this process? What are the key elements for developing more sustainable transport systems? What policy measures are necessary to more effectively mobilise private sector investment to support a transition to a Circular Economy? What are the main priorities in the environmental sectors (waste, water, air etc.) for the mobilisation of EU or other public funds in your country? At the meeting, the EaP CSF took the opportunity to distribute two position papers. The EaP CSF position paper on environment, which was produced by Ina Coseru and other four experts, raises concerns on the deteriorating situation of the environmental institutions in some EaP countries, and calls for the implementation of the Luxembourg Declaration Action Plan, aiming at improving environmental governance with more transparency. The paper also asks for incentives for renewable energy solutions for the local communities and further promotion of meaningful deforestation actions. The EaP CSF position paper on energy, to which Ruslan Surugiu contributed, urges for speeding up interconnections to enhance energy security in the EaP; supporting consistent application of EU rules on energy in AA/DCFTA countries; and improving governance in the energy sector, through conditionality for financial support and technical assistance.